In this extract of a tribute article featured in Issue 16 of AG, Gillian Coote reflects on the life of Dot Butler. IT’S NOT OFTEN you meet somebody much older with whom you feel an instant rapport. But that’s how it was when I first met Dot Butler. That meeting at her home in the tree-lined suburb of Wahroonga, on Sydney’s North Shore, where many of the gardens are grand and formal, befitting the residences. But when I turned into her driveway I was confronted with a blaze of native plants – flannel flowers, eriostemon and grevillea under a canopy of Sydney blue gums. Not a clipped lawn in sight! Dot appeared, nut-brown, barefoot, wearing shorts and wielding a spade. She was preparing her vegetable gardens for the spring sowing, as I found when I followed her to a huge mound of compost, which she spaded into a wheelbarrow and vigorously began to dig into the soil while we talked. We were already surrounded by her giant and luxuriant winter vegetables, exploding with vitality – just like Dot. When I got to know this fountain of wisdom, generosity and positive energy better I doubted if she had ever in her lifetime rested as long as a month! She has a confident spirit born of a deep harmony with life, a radiant smile and a beautiful face, lives simply – working for or sending money to good causes, feeding her ducks, walking with old mates from the Sydney Bush Walkers. She rides her bike to the shops. And why not? Dot has never taken much notice of what society might expect of her. Dot Butler climbing Crater Bluff in 1936. “Eccentricity is just being ahead of your time,” she laughed while sitting on her veranda, her bare legs tanned and muscular. At 5 a.m the next day she would be driving herself to Brisbane to celebrate her 77th birthday with her daughter Rona and grandchildren and help build their mudbrick house. En route she would call on her son Wade and drop off some secondhand doors and windows. Accidents claimed the lives of her other son and daughter (Wendy drowned while cascading with university friends in the Blue Mountains, and Norman from a taipan bite). Dot’s husband died in 1972. Born Dorothy English in Sydney, one of five children, Dot recalls that “all our childhood entertainment was climbing – brick kilns, chimneys, telegraph poles – anything off the horizontal, and always barefoot of course”. So Dot the fearless child became the fearless adult who delighted in walking and climbing. While doing a Sydney University course to qualify as a physiotherapist, she would run to her classes from Circular Quay, taking well under an hour. But her main passion was bushwalking and as an early member of the Sydney Bush Walkers she became a member of “The Tigers”, one of only two women among a select group of gung-ho walkers who loved marathon weekend walks, often covering 150 kilometres. Dot walked barefoot, of course! Her physiotherapy experience convinced her that shoes can ruin women’s posture – and she abandons them at every opportunity. In 1936 Dot and the late Dr Eric Dark, leading climber and bushwalker, made the first ascent of the difficult Crater Bluff in Warrumbungle National Park. As was her habit, Dot climbed in the lead, taking up the rope and finding something to tie it to: they had no pitons, or rock bolts. In re-creating this famous climb for a film, Dot was played by her daughter Rona and Dr Dark by Wade, both experienced climbers. Dot climbed up with the film crew – nimble and sure. I was left far be-low, somewhat shaken. After the war, Dot began her school by founding the Australian section of the New Zealand Alpine Club. Crack climbers from the New Zealand club offered their services, and crevasse rescue was part of the course. 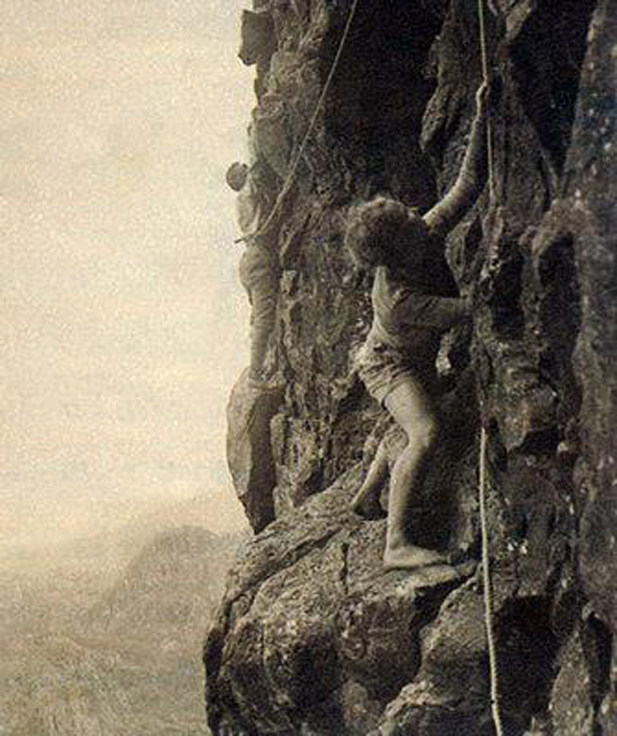 For nearly 30 years Dot took parties of young climbers to New Zealand each Christmas. “Today when I look at all the young people who are climbing the Andes and the Himalayas, and even in Antarctica, I can often say, ‘Well, some of those are my boys’,” Dot said. Mt Dot in New Zealand’s Southland National Park is named after her. 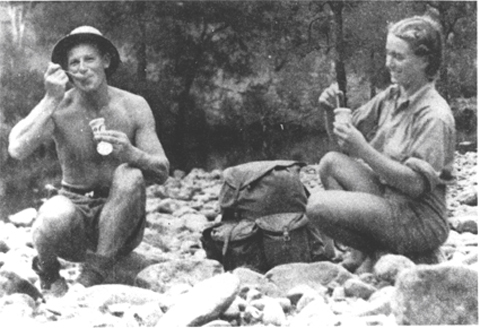 Dot married Ira Butler, a fellow bushwalker, in Australia during the war. He had been posted to Melbourne and proposed by letter. Unable to get a seat on an inter-state train, Dot rode her bike to Melbourne to marry him. On her return journey she rode from Melbourne to Albury on the NSW border before she could get a seat. She estimates she cycled 32,000 km during the war. In 1968 Dot took a crash course in Spanish and be-came organiser and a member of the nine-strong Australian Andean Expedition, which in 1969 made 27 different ascents (13 of them firsts) of 19 mountains in Peru’s Cordillera Vilcabamba. Ira’s work with the Reserve Bank took him overseas, and Dot accompanied him when she could, shedding hats, gloves and sometimes shoes to climb at every opportunity. She has climbed in the Himalayas and the Alps, canoed 640 km down the Yukon River in Canada, and cycled through Ireland, Spain and Cambodia. She says she would like to cycle through China. Her least-documented (for obvious reasons) climbs have been over the arch of the Sydney Harbour Bridge – as a member of a high-spirited group calling themselves the “Night Climbers of Sydney”, who set themselves late-night challenges such as scaling city buildings or finding their way through the underground sewers. When Dot began bushwalking nearly 60 years ago it was in its infancy as an organised pursuit – usually thought of as exercise for eccentrics. Dot Butler passed away in 2008. The Butler Family have continued on Dot’s legacy of barefoot bushwalking.